The studio-gallery of Brian Keeler is located in a former carriage house of the Keeler family home and dates back to around 1860, with an addition added in the 1940’s. The building has served many functions over the years. It was at one time the home of the Wyalusing post of the American Legion. Many local people also remember it or actually attended school there when it was part of the old school and the principal’s office in the 1950-s and 60’s. It was also the studio of the artist’s father, William Keeler, and served as a social and party destination fondly referred to as “Hernando’s” because of the Mexican decorative theme and patron whose small statue still stands sentinel outside the building. As the studio is situated in the little alley behind the Post Office and Peoples State Bank, at 101 School Lane, it is easy to find- only one block from the red light at US route 6 and Route 706. The building also serves as his residence. There are two larger gallery rooms in the downstairs section filled with beautiful artwork. The front room display is periodically changed to coincide with shows and the annual open house in conjunction with the North Branch Arts Festival held in October, during the Columbus Day weekend. The downstairs back room is where his pastel easel is set up and there are usually works in progress to be seen there. 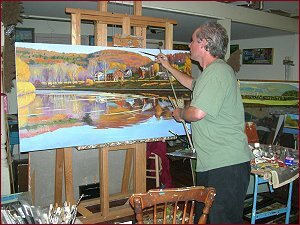 The upstairs is where the large oil paintings, watercolors, and etchings are worked on and additional work is also displayed. The studio is open by appointment or chance. Please call or e-mail to make an appointment.